Here is Morello's brief preview of the Zed's play style and kit, a bit earlier than usual. "Since early antiquity, shadows have long been a subject of fascination. If you’re a scientist, your shadow is probably a simple projection of light. If you’re more spiritual, your shadow might be a reflection of your more shady whims. And if you’re following a forbidden path filled with dark techniques and even darker motives, it’s possible that your shadow is a sinister companion ready to help you pull off a vicious assassination in some dark corner of the Fields of Justice. While we’re delving into the forbidden ways, allow us to introduce Zed, a relentless ninja master who’ll leave your enemies scared of their own shadows." A forbidden new champion stalks the Fields of Justice in the upcoming patch: Zed, the Master of Shadows. 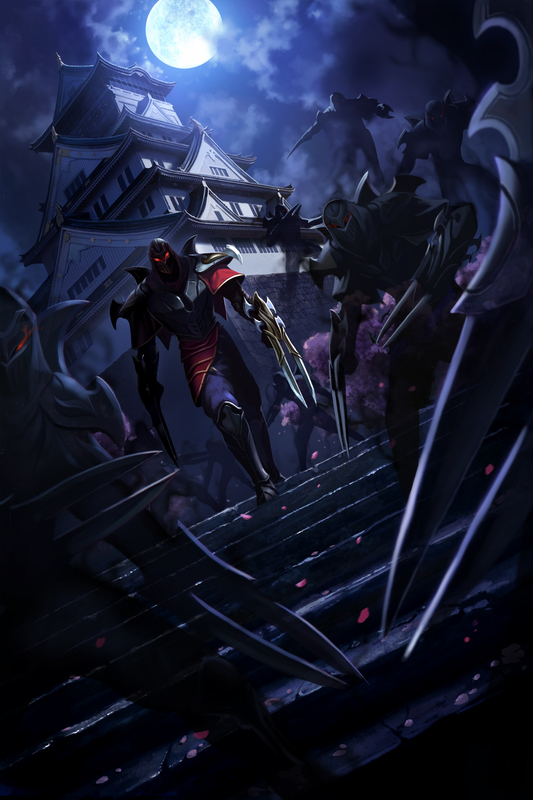 Deadly in many roles, including mid lane and jungle, this dark assassin’s energy-based gameplay revolves around conjuring and commanding shadow clones. Contempt for the Weak (Passive): Whenever Zed attacks an enemy below 50% Health, he deals an additional 8% of their maximum Health as magic damage. This effect has a short cooldown. Razor Shuriken: Zed and his shadow both throw their shurikens, dealing physical damage to any target they pass through. Each Shuriken deals less damage to targets beyond the first. Living Shadow: Zed’s shadow dashes forward, remaining in place for a short duration. Zed’s shadow will duplicate his spells. Activating Living Shadow again while his shadow is active will cause Zed to switch positions with his shadow. If both Zed and his shadow strike the same target with Razor Shurikens or Shadow Slash, Zed re-gains some energy and the target suffers an additional effect: Razor Shurikens deal additional bonus damage and the slow from Shadow Slash is dramatically increased. Shadow Slash: Zed and his shadow both create a burst of shadow, dealing physical damage to nearby enemies. Zed’s Shadow Slash slightly reduces the cooldown of Living Shadow by for each unit struck. The shadow’s Shadow Slash briefly slows enemies. Death Mark: Zed sinks into the shadows and dashes to his target, dealing physical damage. He also spawns a Living Shadow beyond the target, which duplicates his spells and marks the target. After 3 seconds, the mark will detonate, dealing physical damage based on the damage dealt to the target by Zed and his shadow while the mark was active. Zed can reactivate this ability to switch positions with this shadow. Unlike other champions with illusions, Zed’s shadow clone is the lynchpin in his kit. With a shadow clone active, Zed’s abilities are duplicated, allowing him to deal more damage, apply additional effects, or even engage an enemy from an unexpected angle. Zed can even switch places with his clones to perform surprise initiations or quickly head off a fleeing enemy. This ability to strategically reposition combined with some hefty bursts of both physical and magic damage to make Zed versatile across multiple roles. When playing Zed in lane, Razor Shuriken can both harass the enemy and rapidly clear minions, making him a powerful bully. Spamming Razor Shuriken allows Zed to shove the lane and keep pressure up, buy time to roam, or stifle a push to drive enemies off his tower. Meanwhile, using Living Shadow to set up creative angles on your lane opponent can complicate juke attempts and allow you to land full damage nukes. Zed’s ganking and pursuit power also makes him an ideal jungler. Switching places with your shadow clone via Living Shadow creates opportunities for lightning-fast initiations, escapes, and even buff steals. The powerful slow from a cloned Shadow Slash can also lock down an enemy champion, leaving him vulnerable to execution from a heavy hitting attack charged with Contempt for the Weak. Once the team fights start, Zed’s clone enables him to alternately deploy his abilities from a safe distance or deal even more damage when he charges into the fray. He can also combine Living Shadow with Shadow Slash to blanket an area with a high-intensity slow, throwing off enemy positioning. Finally, Death Mark is an excellent cleanup ability to chase down and finish off fleeing low-health champions. The bonus magic damage from Contempt for the Weak is a great way to top off Death Mark’s detonation damage for surefire killing blows. Managing this clone-and-combo kit is crucial to dominating with Zed. Strategically positioning Zed and his clone for a two-pronged assault before deploying your skillshots will ultimately make or break your success on the Fields of Justice. I didn't like him !